Was Wiesel a strange choice? What has Mr. Wiesel ever done for “peace” or, even more to the point, “world peace?” He was a devoted Zionist even in his youth, working as a journalist for Zion in Kampf, a Yiddish newspaper in Paris (see here). He had many contacts with the Irgun terrorist organization and cheered on their every action; he may well have been even more deeply involved with Irgun. He stated in his memoir that “I belonged to the Irgun.” He has supported every illegal military action in which Israel took over more land, homes and livelihoods of Palestinians, right up to his being an apologist for the latest unprovoked attack on Gaza in 2008-09 when the Jews used white phosphorous bombs on civilians. Wiesel has never sought to act as a peace-maker in these ongoing unbalanced attacks, nor has he criticized or sought to stop the many wars of the United States since he became a citizen in 1963. He has also promoted a virulent anti-Germanism, e.g. “Every Jew should set aside a zone of hate – healthy, virile hate – for what the German personifies and for what persists in the German.” He has never publicly repudiated this statement. 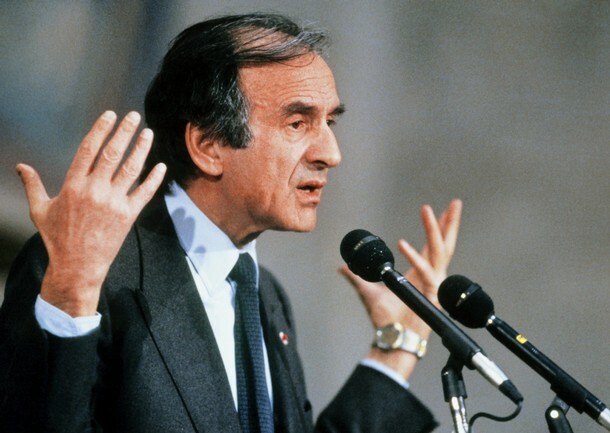 So why was Elie Wiesel chosen for the most prestigious award in the Western world, the Nobel Prize for Peace, in 1986 when it still carried a dignified aura? (It has since lost some of that glow because so many of its recipients, including Wiesel, have lost theirs!) You’ll find the answers in the article below from The New Republic that appeared in November 1986 before the Nobel award ceremony took place on Dec. 10. 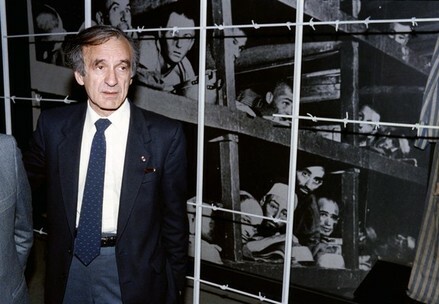 Elie Wiesel gives a speech after the Nobel awarding ceremonies on December 11, 1986. How to get a Nobel prize. Actually, they did a little more than pray. Over the past several years, a few of Wiesel’s friends have circled the globe in an intensive effort to win him the prize. Sigmund Strochlitz (in photo below left), who owns a Ford dealership in New London, Connecticut, has directed the offensive. A survivor of Auschwitz, Strochlitz has visited the halls of Congress, the West German Bundestag, the French Assembly, and the Norwegian Parliament on Weisel’s behalf. It might sound difficult to lobby for the Nobel Peace Prize. In reality, it’s not so tough. According to the rules of the Norwegian Nobel Committee, several categories of persons are eligible to make nominations. Parliamentary representatives, judges, academic, and former Nobel laureates are among those entitled to send letters of nomination to the committee in Oslo. They’re due by February 1. Strochlitz’s strategy has been to solicit these letters by the bushel. He’s succeeded in getting hundreds of them, including nominations from Francois Mitterand and former Peace prize winners Henry Kissinger, Lech Walesa, and Mother Theresa. Wiesel’s supporters have concentrated much of their energy on the U.S. Senate. One Senate aide described their campaign as “relentless and heavy-handed.” “Strochlitz would show up every winter and say “it’s time to write letters again,” one staffer said. “He’d say, ‘you did it last year. It’s time to do it again.’ He’d get the senators to send ‘Dear Colleague’ letters to each other in an every-widening circle.” Strochlitz, a close friend of Wiesel’s, denies doing any campaigning. It is my honor to propose Mr. Elie Wiesel for the 1984 Nobel Prize for Peace. As you well know, Mr Wiesel has dedicated most of his life toward the goal of peace throughout the world. In my opinion, you could not go wrong by awarding the Nobel Peace Prize to this most deserving gentleman. By Strochlitz’s count, more than 50 senators and 140 representatives have written to Oslo on Wiesel’s behalf. More than 70 members of the West German Bundestag have also nominated Wiesel. After getting a few dozen senators under his belt, Strochlitz began grouping them in interesting ways. One year he got the entire Massachusetts congressional delegation to nominate Wiesel. Another year he solicited letters from all the members of the Senate Banking Committee. Strochlitz was helped by John Silber (right), the president of Boston University, where Wiesel teaches. 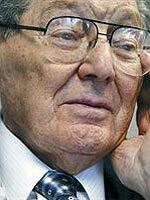 Silber called Strochlitz “the real strategist and campaigner.” “Strochlitz did everything in his power,” Silber said. “he would say to me: ‘John, you know these people in Congress.’ I’d write to them and send copies of their responses to Strochlitz, so he could keep track of everything we were doing.” Silber said that he is especially delighted at Wiesel finally winning the prize, since it is the second such award bestowed upon someone associated with his school. Martin Luther King, who won the Peace Prize in 1964, was a student at Boston University during the 1950’s. Another of Silber’s tactics has been to suggest appropriate anniversaries for the Nobel Committee to make use of in honoring his friend. In 1984 he wrote of the connections between Wiesel and Orwell. The following year Silber’s letter reminded the committee that it was the 40th anniversary of the liberation of the death camps. Wiesel’s friends searched endlessly for a new “peg” on which to hang the same old story. According to all published reports, Wiesel has been on the Nobel Committee’s short list for the past few years. And this year members of the jury thought it necessary to make a non-controversial selection. Last year’s prize, which was shared by Soviet doctor Yevgeny I. Chazov, of the Boston-based Physicians for the Prevention of Nuclear war, humiliated the committee when it was revealed that Chazov had denounced laureate Andrei Sakharov several years earlier. In 1986 it was the West’s turn to be mollified. Looking down the list of past winners, one wonders what the prize is actually for. Some years it appears to reward good deeds on a large scale. Other times, it seems to honor political leadership. On a few occasions, such as 1973, when it was awarded jointly to Henry Kissinger (left ) and Le Duc Tho, it has seemed closer to a war prize than a peace prize. These days, it’s a rather amorphous accolade–sort of a moral hall of fame for the indisputably decent. Whatever the Nobel Peace Prize signified, it’s clear that people lobby for it. Nobody seems quite sure what Japanese prime minister Eisaku Sato won his Nobel for in 1974, but it’s well known that he hired a public relations firm to help his campaign along. Jimmy Carter, Armand Hammer, and Indira Gandhi have been among the more recent campaigners who appear to have failed in drives for the prize. (Hammer reportedly once sent Ann Landers a jade necklace with a note asking if she could help him get nominated for the prize.) Mohandas Gandhi never campaigned for, and never got, the most coveted prize on planet earth. This is the photograph (in background) in which the New York Times identified Elie Wiesel, as a 16 year-old boy, for the first time in Oct. 1983 when the campaign for a Nobel Prize for Wiesel had gotten underway. In 1986, just days after winning the coveted prize following his three-year campaign, he stands in front of the photo during his visit on December 18, 1986 to the Holocaust Memorial Center ‘Yad Vashem’ in Jerusalem. Actually Elie Wiesel and the Dynamite Peace Prize are a good Orwellian match, since one is an impostor and the other a hoax.